It’s all quick things today — we spent the day traipsing around Maryland on a food field trip (see quick thing #3), and I need to eat dinner! Shana and Joe of Talking Breads are on their honeymoon, so we’ve got the TB standards frozen while supplies last; they’ll make their reappearance in fresh form on April 27. Standing in on Thursday, we’ll have a limited selection of McGrath’s breads. Full line-up on Friday & Saturday! Do you carry the Spring Farms Chesapeake Kraut? Or their new Garlic Pickle relish? Love their Curry Kraut. I’m sorry I just saw this comment! 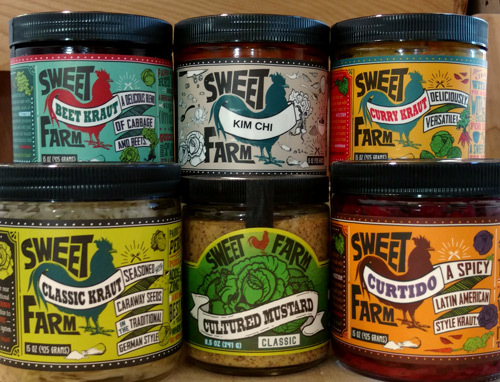 We carry Sweet Farm’s Classic Kraut, Beet Kraut, Curtido, Kim Chi, and Curry Kraut, but I’m afraid we don’t stock the Chesapeake or the Garlic Pickle relish. So many krauts, so little refrigerator space!